All the Big Lip “Frankie” Saxophones are made with a Cupronickel body, matte silver “Shot Blast” finish with black nickel neck, bell and bow. 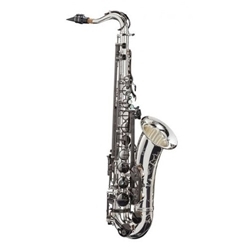 The Big Lip “Frankie” Saxophone has rolled tone holes, Reactor Panel pads, an engraved bell and lower pad cups, semi-precious stone finger buttons, adjustable thumb hook, 3 ring strap hook and a high F# key. Complete with a deluxe lightweight flight style case featuring a durable weave cover with special “Frankie” stitching, backpack and shoulder straps and two outer pockets, mouthpiece, cap, ligature and strap.